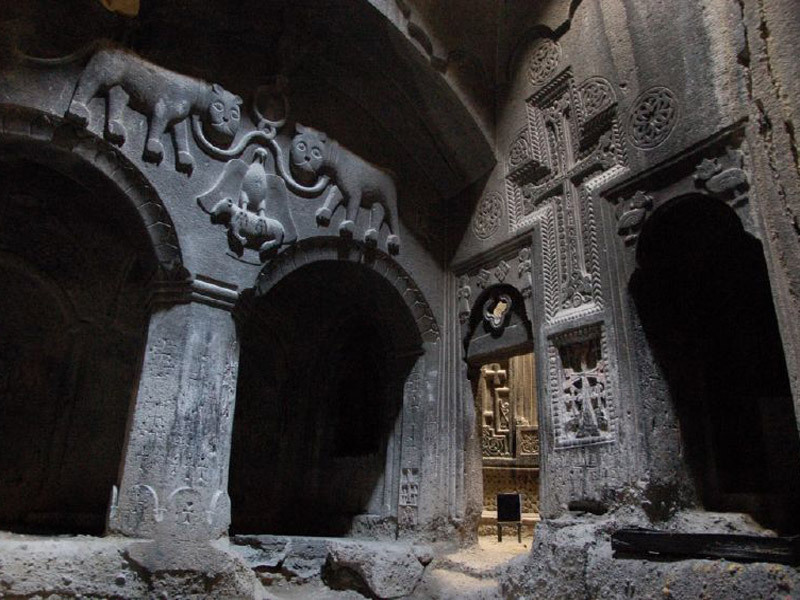 The monastery complex of Geghard is one of the most outstanding sights in Armenia. Nearly any tour to the historic sites of Armenia starts with this ancient monastery! If an Armenian family has a guest from a foreign country, the next morning the host of the house is likely to say: “First we should start with Garni-Geghard”! The first thing that captures and fascinates travelers is the inexpressible and breathtaking spirit of antiquity. 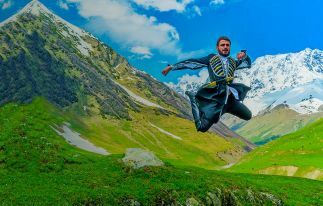 Just imagine standing in the middle of an ancient monastery carved into a rock, with magnificent views of the surrounding mountains, and it’s here that with every breath you feel a thousand-year history, which is literally stamped at every bend of the stone! The monastery complex of Geghard is also popular due to its close location from the capital of Armenia, Yerevan. The monastery is only 36 km away from Yerevan. The one-way road from the capital to the ancient temple takes only 45 minutes. The road to the monastery is extraordinarily picturesque: on the way to Geghard you can see magnificent mountain landscapes in tandem with the sun and fresh air. On the way to Geghard, passing through the towering cliffs along the gorge of the Azat River, you can also see numerous caves that were once carved into the rocks. In these caves, archaeologists have found numerous cave paintings. This proves that once it was inhabited by Prehistoric men. 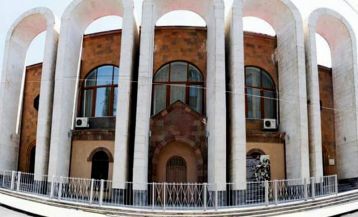 The history of Geghard has more than 1500 years. Gegard, being a unique cultural monument, is a world heritage of human culture. According to legend, the monastery was founded in the first decades after the adoption of Christianity as a state religion in 301 by Gregory the Illuminator. However, originally the monastery was a small cave chapel. According to a legend, during the pre-Christian times there was a sacred spring that is why the place was chosen for the construction of the chapel. Hence the original name of the monastery once was Ayrivank, which in Armenian means “cave monastery”. Over the years the complex grew, the number of monasteries increased. In 1215 the main and most prominent monastery Katoghike was built. The present name of the monastery is associated with a beautiful tradition. According to legend, the monastery of Geghard was named in honor of the spear, with which the Roman legionary pierced the body of Christ on the cross. 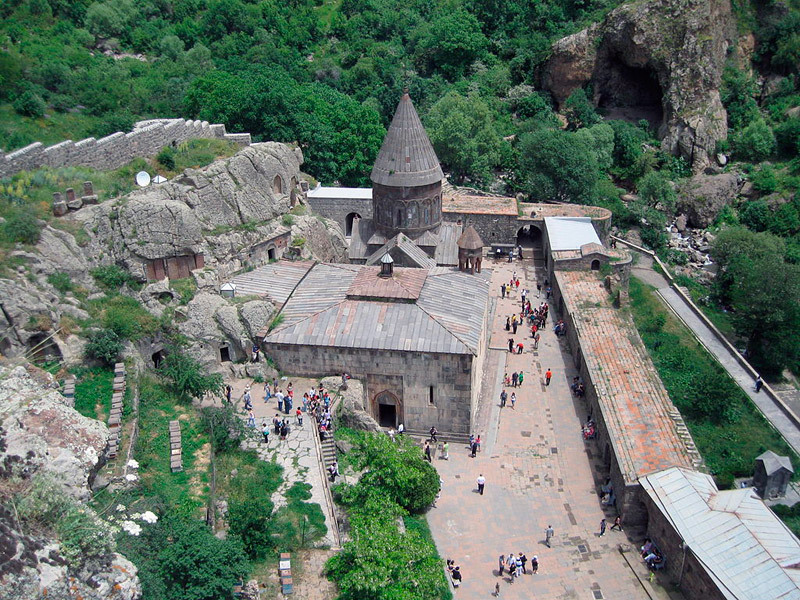 Translated from Armenian, Geghard means “spearhead”, and Gegardavank means “monastery of spear” respectively. After the crucifixion, the “Longine’s Spear” was taken to the monastery. 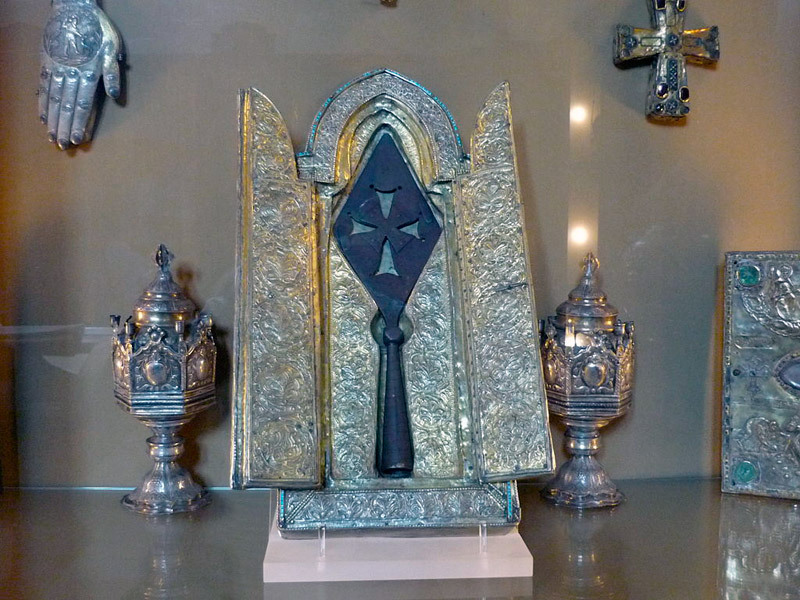 At present, the main relic of Geghard – the spear – is stored in the treasury of Echmiadzin, the spiritual center of the Armenian Apostolic Church. In addition to the spear, the relics of John the Baptist and St. Andrew are also kept in the monastery of Geghard. 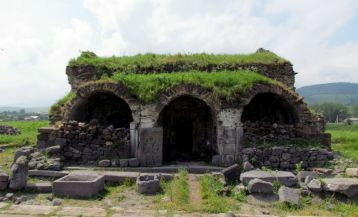 Geghard monastery was one of the spiritual and cultural centers of medieval Armenia, where besides religious buildings there were also such institutions as school, library, printing house. The monks lived in cell-caves carved next to the monastery. Monks made a great contribution to the development of calligraphy art. The school at the monastery had a repository of manuscripts. Some of the manuscripts are now stored in the Matenadaran named after Mesrop Mashtots. Geghard is primarily famous for its architecture. This architectural miracle is literally carved in the depths of rock. On the walls of the ancient temple you can see remarkable bas-reliefs and unique khachkars, which are carved in memory of the deceased. The symbol of the princely family Proshyan – a lion conquering a bull, is engraved on the walls of the monastery. Inside the temple. there is a spiritual, solemn atmosphere. Thanks to acoustics, during church singing, the monastery is filled with divine, angelic music. Inside the church. there is also the family tomb of Proshyan princes. Interesting legends and traditions are connected with the monastery. For example, there is a belief that Geghard helps your dreams come true. On the outer walls of the monastery, you can see curious grooves full of pebbles. 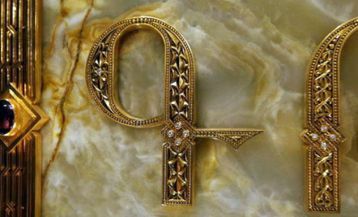 There is a beautiful belief that if you make a wish, throw a pebble-stone from below and get into a groove, your dream will certainly come true. Another unique fact that distinguishes the monastery from others is the holy spring that flows right inside the church. People throw coins here, making wishes. 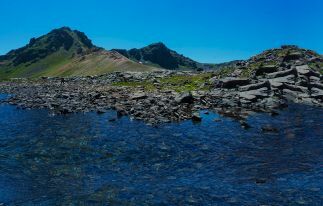 The water in the spring is considered holy. People make ablutions, and also fill the bottles with holy water and take with them. The monastery complex of Geghard is undoubtedly a world heritage that is why it is included in the UNESCO World Heritage List.